There's still time to be involved in Christmas Bird Counts! 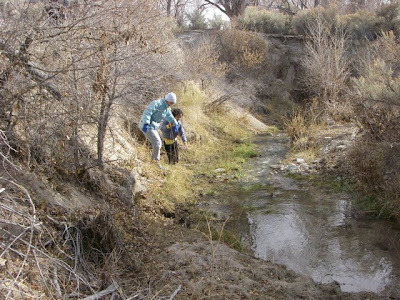 Here's a post on Protect Snake Valley about an upcoming one, along with some preliminary results from other area bird counts. 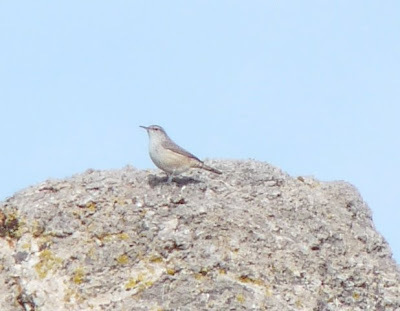 Do you know the bird pictured above? 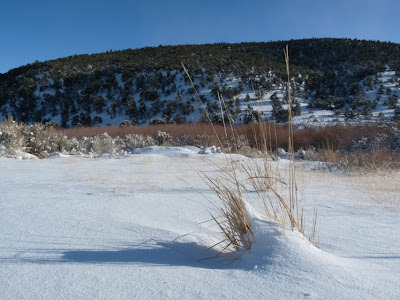 It was a surprise in the South Snake Valley Christmas Bird Count, the first time it had been seen in the winter count. The answer is at the link. 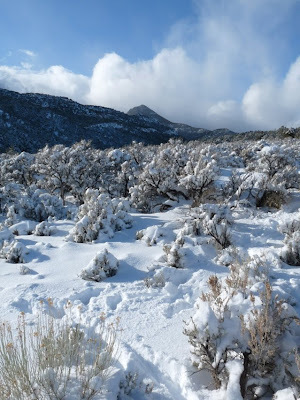 We've had a very enjoyable Christmas in the high desert, with even some snow to make it a white Christmas. While it might seem like Christmas is done and all that remains of the holiday season is New Year's, there are some old traditions that keep Christmas going. One of these is the Twelve Days of Christmas, which goes from Christmas to Epiphany, January 6, the day recognized as when the Three Wise Men arrived in Bethlehem with gifts for Jesus. In fact, some European cultures celebrate Christmas with family and friends and good food, but do their gift giving on Epiphany. One tradition my parents had that we've adopted is to open one present a day during the twelve days of Christmas (or until they run out). This allows each gift to be cherished more and for the giver to be remembered for more than a few moments. It also is a great way to teach kids (and parents) to wait. All good things come with time...and recycled presents are still happily opened because part of the fun is unwrapping a surprise! On the First Day of Christmas, my true love gave to me A Partridge in a Pear Tree (Jesus). On the Second Day of Christmas, my true love gave to me Two French Hens (Old and New Testaments). On the Third Day of Christmas, my true love gave to me Three Turtle Doves (Three Theological Virtues: Faith, Hope, and Love). On the Fourth Day of Christmas, my true love gave to me Four Calling Birds (Four Gospels: Matthew, Mark, Luke, and John). On the Fifth Day of Christmas, my true love gave to me Five Golden Rings (Five Books of Old Testament known as Torah or Pentateuch: Genesis, Exodus, Leviticus, Numbers, Deuteronomy). On the Sixth Day of Christmas, my true love gave to me Six Geese a Laying (Six Days of Creation). On the Seventh Day of Christmas, my true love gave to me Seven Swans a Swimming (Seven Gifts of the Holy Spirit: prophecy, ministry, teaching, exhortation, giving, leading, and compassion). On the Eighth Day of Christmas, my true love gave to me Eight Maids a Milking (Eight Beatitudes). On the Ninth Day of Christmas, my true love gave to me Nine Ladies Dancing (Nine Fruit of the Holy Spirit: love, joy, peace, patience, kindness, generosity, faithfulness, gentleness, self-control). On the Tenth Day of Christmas, my true love gave to me Ten Lords a Leaping (The Ten Commandments). On the Eleventh Day of Christmas, my true love gave to me Eleven Pipers Piping (Eleven Faithful Apostles). You can find more explanations for all of these. We will likely be taking down some of our Christmas decorations before the Epiphany, but we'll be enjoying the Christmas season until then. Any excuse to have a prolonged celebration is a great idea, right?! 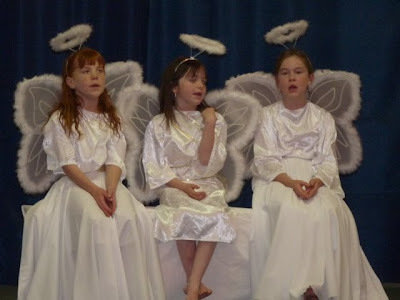 Here's the last part of Joy to the World sung by the cast of the 2009 Nativity Play. 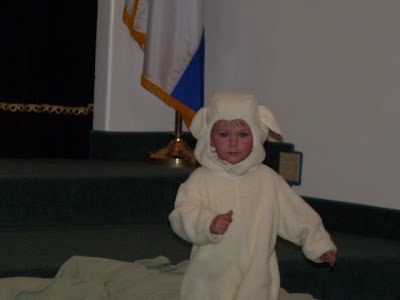 Desert Boy is on the far right in the sheep costume. You can see some great photos of the performance on Faberlicious. Merry Christmas! 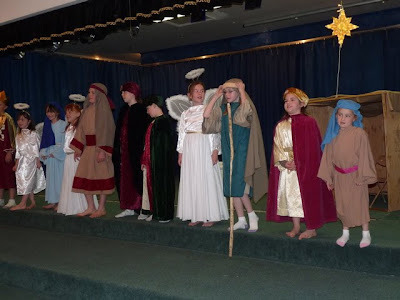 Tonight we will be celebrating by going to a Candlelight Service and Nativity Play. The play will include Desert Boy as a sheep. It will be his first opportunity to be in a play, and I have a feeling he will like it. 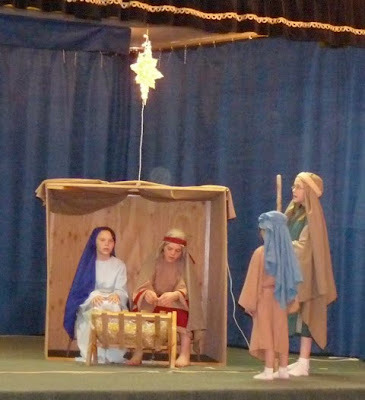 Above, he's hanging out with Mary in the stable. 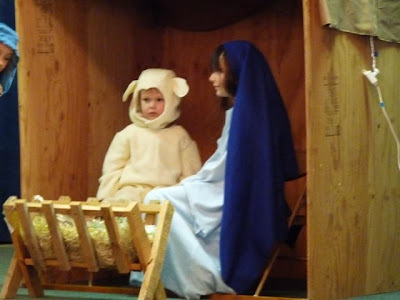 Mary is his cousin, so that's why he got invited into the stable. He's a pretty coordinated sheep to be sitting on a stool like that. 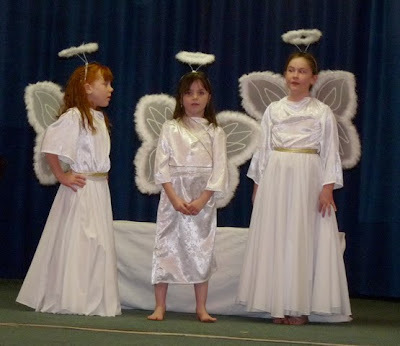 The play also features these three adorable angels, who tend to get distracted easily, as you will see. Desert Boy's cousin Kayli has a solo, which she sings quite well. 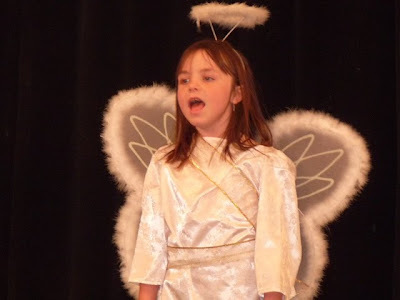 She is the angel Gabriel, so she had a lot of lines to memorize. Here she is appearing to Joseph to tell him that his fiancee is with child and that it's okay. The play is set up so you see most of the cast of characters for the entire performance. 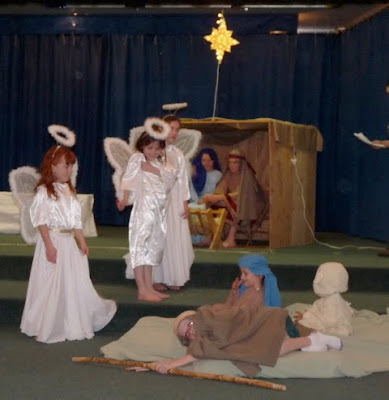 King Herod and his messenger are on the far left, the angels in the middle, Mary and Joseph in the stable on the right, and the shepherds and their sheep just off the stage. 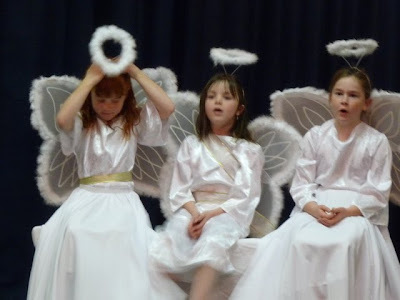 The angels appear to have a little attitude here. 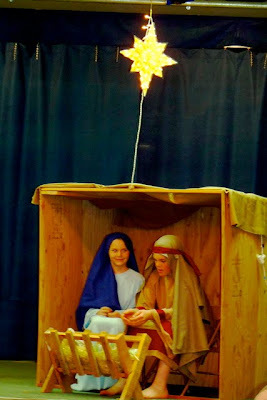 Mary and Joseph entertained themselves during slower parts by picking straw out of the manger. 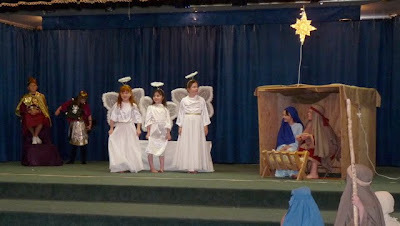 Later the angels appeared to the shepherds to tell them about the newborn king. 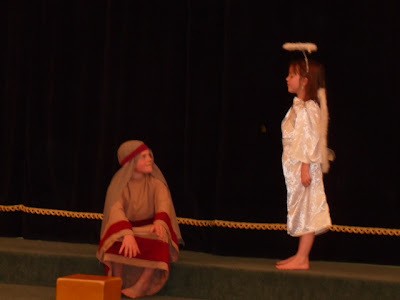 The shepherds traveled to the stable to visit. The sheep was left behind and was content for a little while. ...and the sheep decided to make a run for it, heading straight for Mama. I wonder if that will happen tonight. It will be dark in the auditorium, so it might make it harder for him to find me. At the end, the entire cast performed Joy to the World. Minus the sheep who was hanging on to Mama. 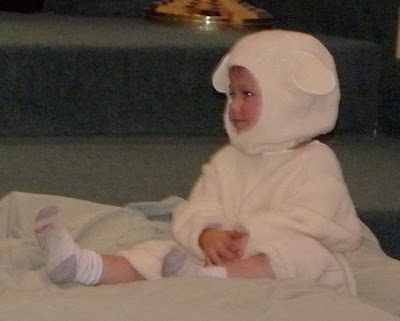 And another sheep and angel who were napping during the dress rehearsal. I think it will be an entertaining show! We're in the middle of a snow storm, which is appropriate for the second day of winter. The good news is that the days are getting longer now! To celebrate, here are some photos from last weekend, when we went to get our Christmas tree. Our plan was to drive up high enough in the mountains to get a white fir tree. They are so pretty, and the BLM permit is only $4. But the snow got a little deep. We drove until the trucks wouldn't go any further, and we were still far from the white firs. 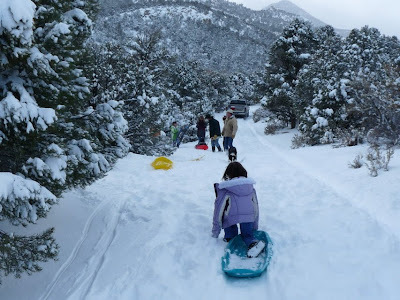 So that meant plan B: get out the sleds and have some fun! 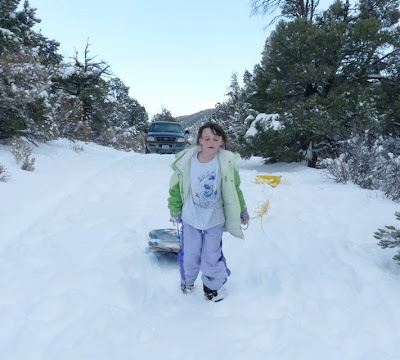 Megan is concentrating hard as she pulls two sleds. She is always warm, so that's why her coat is open. Desert Boy didn't get along with the snow quite as well. 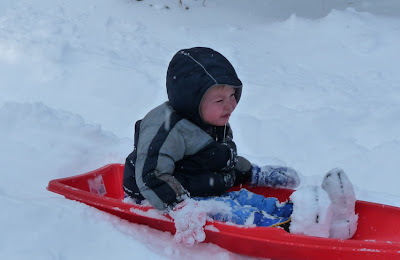 He quickly tipped out of his sled and got snow covered and didn't like it. 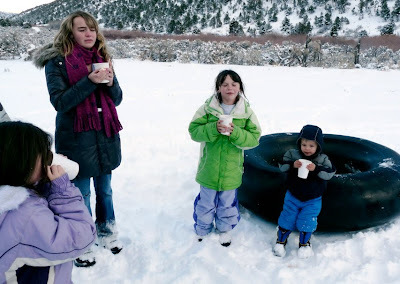 Sometimes sledding isn't so fun. Fortunately a little hot chocolate and some cookies can quickly brighten everyone's attitude. Not that you can tell by this photo! I love the grimaces--but they really did feel better soon. 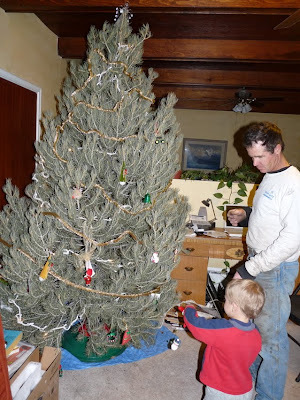 My husband found a nice pinyon pine tree and we took that home. Desert Boy was old enough to help decorate it--at least he was old enough to pick up ornaments and give them to Dad to put on the Christmas tree! We had a last-minute getaway weekend vacation, and it was nice to get out and enjoy some different scenery. 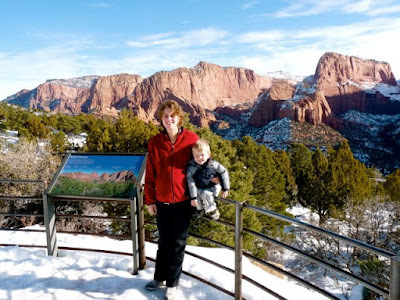 Although most of our time was spent shopping, eating out, and in the hotel pool, we also went to the northwestern part of Zion National Park, called Kolob Canyons. 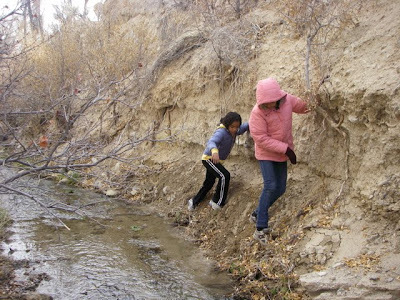 Not far from Interstate 15 is a five-mile scenic drive with several trails leading off from it. The trails were snow-covered and we weren't prepared to go on them (we have hiked some there in the past and it is quite relaxing). Instead we enjoyed the contrast of the bright, white snow on the orange sandstone with the evergreen accents. We didn't manage to take too many photos. 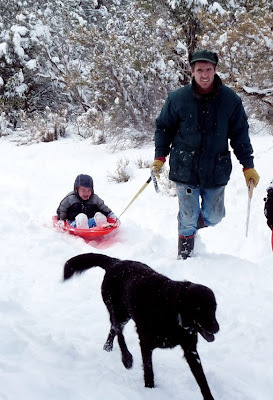 Desert Boy was very interested in hiking in the snow and even places where he could slide down steeper slopes. There weren't many visitors, so he was free to run and use up some of his boundless energy. The melting snow caused extra rocks to roll down some of the road cut areas--the power of erosion was clearly evident. 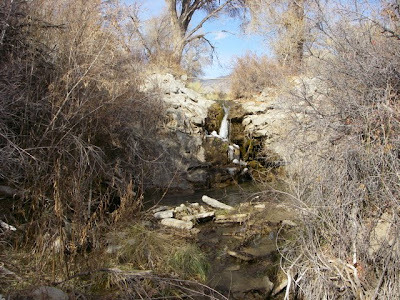 If you're not hiking, this is a quick detour that shows off some of the spectacular Utah scenery. There's also an advanced canyoneering route in this area; some day I'll have to return to give it a try. 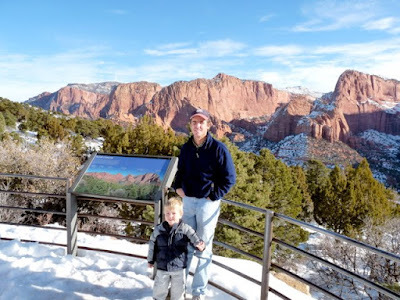 For more info about Kolob Canyons, click here. I went to check on Desert Boy during his nap. His bed was empty, and I wondered where he had gone off to. I knew he didn't want to take a nap and had been trying all sorts of things to avoid it. 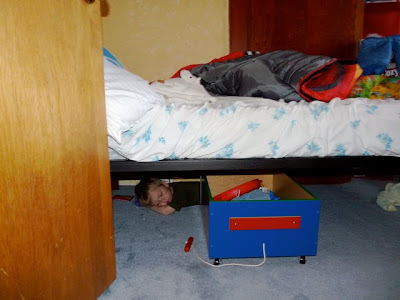 Then I looked under the bed and found he had fallen asleep after all, tucked away behind his toy box. I wonder if he will make that a regular sleeping hideout. 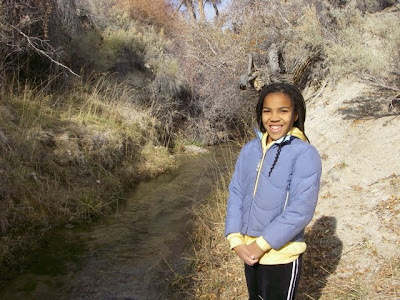 This blog is posted at Protect Snake Valley. 2009 marks the 110th Christmas Bird Count, a remarkable data set. Every year from mid-December to early January, Christmas Bird Counts are held throughout the country (and in a few places outside the U.S.) to document what birds are within a 7.5 mile radius circle. Over the years, this data shows what bird species are increasing or decreasing. 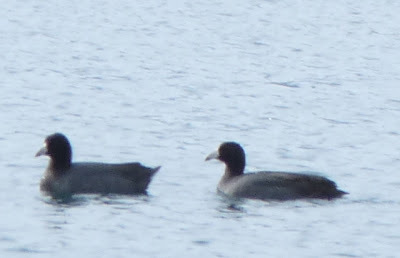 Yesterday I went to Ely to help with their first Christmas Bird Count. It was an enjoyable day, despite the huge numbers of European starlings, Eurasian collared doves, and house finches we saw--all non-native species. We did manage to see some more unusual birds, like a flock of cedar waxwings in someone's yard, two sharp-shinned hawks cruising by bird feeders looking for an easy meal, and two rough-legged hawks out in the Steptoe Wildlife Management Area. I haven't heard the final numbers, but I think the preliminary ones are 41 species and over 4,000 birds counted for all the groups. 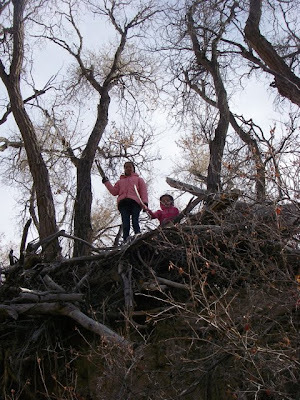 The fun continues tomorrow, with the Snake Valley Christmas Bird Count. And then Fish Springs National Wildlife Refuge has one on January 3. For more info, visit the Christmas Bird Count website. 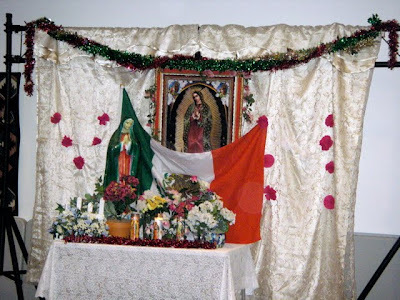 Today is an extremely important day in Mexico and many other parts of the world, the Feast of the Virgin of Guadalupe, or Our Lady of Guadalupe. According to tradition, in 1531, a native peasant named Juan Diego was walking by a hill close to Mexico City when a young woman appeared to him, surrounded by light. 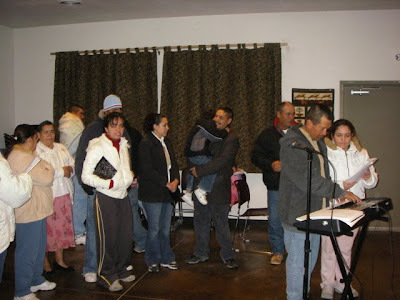 She asked in his language, Nahuatl, that a church be built for her at that site, and he recognized her as the Virgin Mary. He went to the local bishop and related this request. The bishop didn't believe him and asked for a miraculous sign to prove his claim. Juan Diego returned, asked, and the Virgin Mary told him to go to the top of the hill and gather some flowers. Although it was December, he found roses in bloom, and took them in his cloak, his tilma, to the bishop. When he opened the tilma, the roses fell out and the image of the Virgin Mary was imprinted on the cloak. The church was built, and is one of the most visited sites for Christians, with 18-20 million visitors yearly. The tilma still remains intact within it. The Virgin of Guadalupe is a uniting force among Mexicans and others, and is in fact called the Patroness of the Americas. Many miracles have been attributed to her. The feast day is December 12, and this morning many gathered before sunrise to sing the Mananitas (morning songs) and pray. There are numerous songs dedicated to the Virgin of Guadalupe, along with an array of traditions, of which I'm still learning. 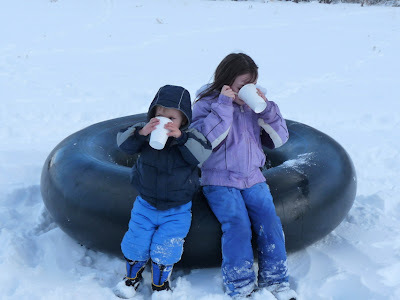 It's freezing outside--no wait, it's below freezing outside! But we have had some marvelous sunrises and sunsets lately. Here are the mountains to the west of us. December 6 is Saint Nicholas' Day. Do you celebrate it? Ever heard of it? When we were kids, my parents had us put out our shoes the night before, and when we woke up in the morning they were filled with fruit and candy. Why? They were remembering Saint Nicholas. Saint Nicholas is the original Santa Claus. He was a real person, but he didn't live at the North Pole, he lived along what is today the southern coast of Turkey in the third century AD. His wealthy parents died while he was a young child, and he used his inheritance to help the poor, the sick, and the suffering. He became a Bishop while he was young, but then under a Roman Emperor was imprisoned for his beliefs. He was eventually released and went on to continue to help people. Even after his death in 343 AD, people continued to remember his good deeds. One story involved a poor man who had three daughters. In order for them to marry they needed dowries, but he had no money, so the daughters were destined to be sold into slavery. On three different occasions, bags of gold mysteriously appeared, providing the needed dowries. The bags were reportedly thrown though an open window and landed in stockings or shoes laid out before the fire to dry. And thus was born the custom of hanging Christmas stockings so that Santa Claus could fill them. St. Nicholas is also known as a protector of children, the patron of sailors and voyagers, and friend or protector of all in trouble or need. In parts of Europe, Saint Nicholas' Day is the main gift-giving day of the Christmas season, reserving Christmas day for more focus on the birth of Jesus Christ. For more information about Saint Nicholas, and how he was transformed by writers, artists, and companies into the modern day Santa Claus, see this informative website. When one thinks of prosperous areas in the U.S., usually the large, populated areas come to mind. After all, where do homes cost the most, so therefore where must the most prosperous people be living? A new report measures prosperity in slightly different terms. Counties that had lower poverty rates and unemployment rates and fewer high school dropouts and housing problems than the country at large were considered to be prosperous. And the results showed many of those counties are in the Great Plains and Midwest states. The brighter red on the map below, the more prosperous the county. Map by Andrew Isserman, Edward Feser, Drake Warren, University of Illinois. The data for this study were from 2000, and instead of focusing on income and growth, more traditional measures, the researchers looked at outcomes. What areas keep their kids in school the longest? Have lower unemployment rates? Better health? The center of the country appears the brightest red. The counties in these areas have less income inequality, better education, and more off-farm jobs than less-prosperous counties. 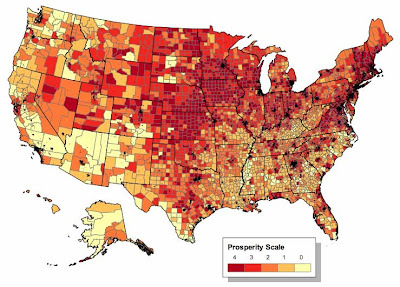 The prosperous counties had an average growth rate of two percent over the previous decade, compared to eleven percent for the less-prosperous counties. Obviously quick growth is not a recipe for prosperity. I find it refreshing to find someone looking beyond money to determine what makes a prosperous area. There really is so much more to consider. How does your county fare? To see more, visit LiveScience. One morning last week while the California cousins were visiting, Uncle Tom offered to take us for a hike along Silver Creek. It was a sunny, windless morning, thus perfect for the hike. 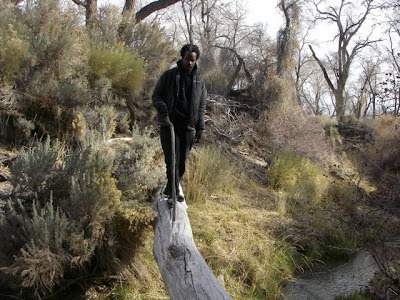 We started right at the edge of the creek, crossing over it. 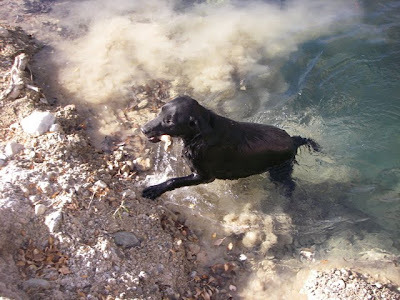 Henry came, too, and found a nice deep pool where he repeatedly swam to get sticks out. 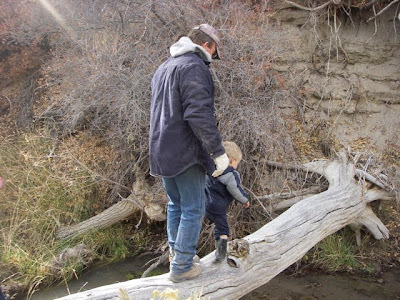 It didn't matter to him that both the air and water temperatures were well under 50 degrees F.
We hiked along the creek for awhile, dodging the huge sagebrush and greasewood brushes, and peering over the edge to get periodic glimpses of the creek. 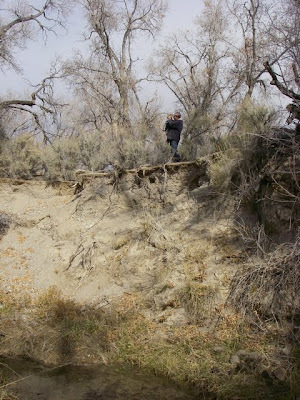 Big snow years and flash floods in 1952, 1982, and 2005 have cut down the channel considerably, leaving sheer banks of crumbling dirt over twenty feet high in many places. 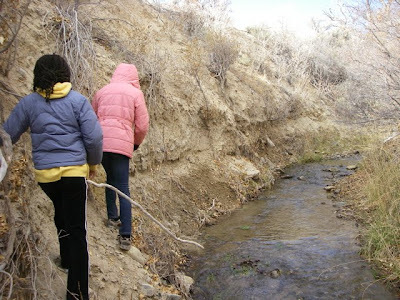 Eventually a couple nieces and I couldn't resist the urge to go hiking right along the creek bottom. We weren't wearing footwear appropriate to get wet, so it was a bit of a struggle in places to stay dry. I was amazed at how many springs entered the creek, as shown by abundant watercress in areas. The watercress generally grows where the water temperature is steadier and there are more nutrients, which is what the groundwater provides. 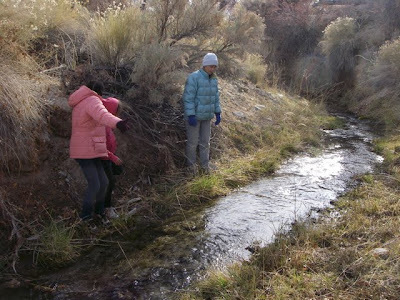 The faster-moving stream water generally has less nutrients and during the winter gets much colder and in the summer warmer than the groundwater. Here's Ruby, showing her appreciation for our adventure hike. Uncle Tom still had Desert Boy and was up on top of the channel at this point. And the nieces wandered up to find a cow skeleton. They took some of the vertebrae and the jaws home with them. Eventually everyone came down to the stream. 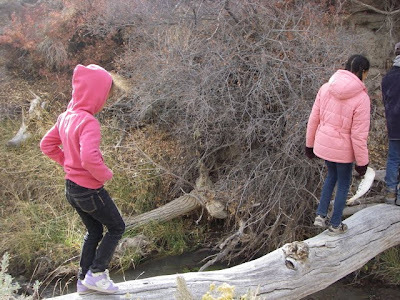 We proved our balancing skills crossing the log across the water. Grace and Lola, who regularly go to gymnastics classes, had no problem whatsoever. Notice the jaw bone in Grace's hand! Uncle Eugene kept a stick with him to make sure he wasn't going to plunge over. 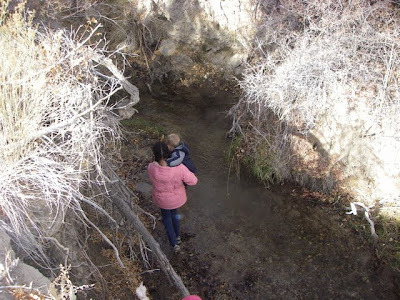 Part of the fun of the hike was the many times we had to cross the creek. 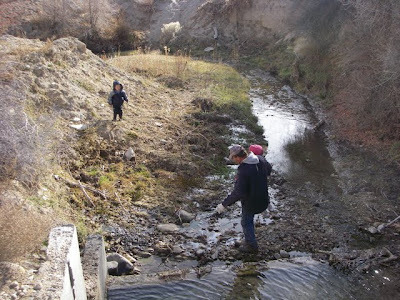 It was just wide enough that it was hard to jump over, so we had to look for places with stepping stones or add some of our own. Grace is carrying Desert Boy down next to the stream now. 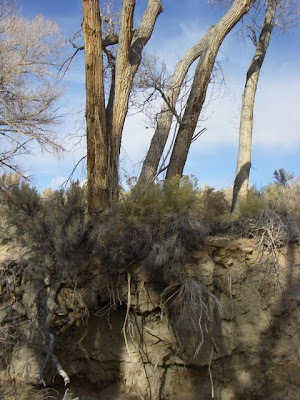 I was awed by the roots of the big cottonwood trees. Much of the dirt that had previously contained the roots had washed away, leaving the tendrils hanging. 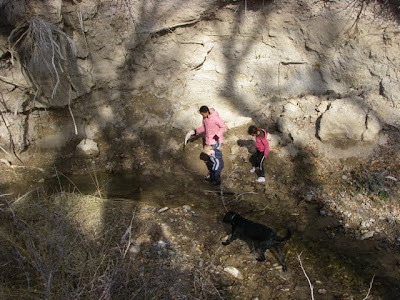 Grace, Desert Boy, and Lola continude to find a dry path next to the stream. Desert Boy was actually wearing irrigating boots, but he had flooded them fairly early on. Nevertheless, he seemed to get the concept that he was supposed to stay to drier ground. Most of the time. And then we came to a small waterfall. It was cool looking, and the perfect end to the hike. Almost. 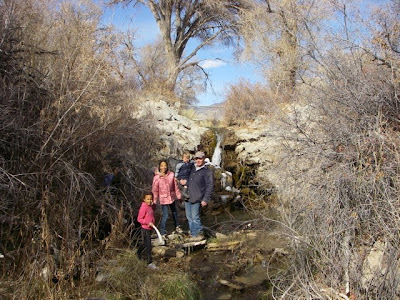 Lola, Grace, Desert Boy, and Uncle Tom pose in front of the waterfall. 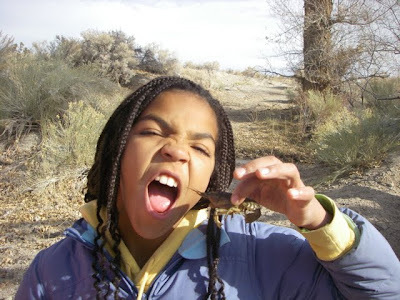 ...a crawdad! Ruby is ready to taste it. Now this was the perfect end to the hike.